As I was doing my usual reading of old newspapers I ran across this advertisement. 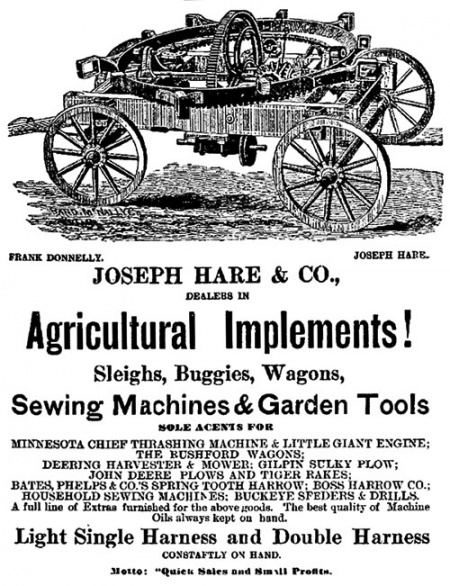 Ads for agricultural implements aren’t unusual, but this one in a May 1884 issue of the Bismarck Tribune caught my eye because of the odd device at the top. Mounted to a wagon are a large array of gears and pulleys, with no immediate explanation of what it does. It doesn’t have the parts to be a harvester, or a binder, or a thresher, and way too many gears to be a plow or a rake. What could this mysterious machine have done for a Dakota Territory farmer of the 1880s? The main clue is the big wheel in the middle. Spaced evenly around its bullwheel are 10 square loops, alternating a large one and a small one. I’ve seen these before, on a horse-powered hay-baler. You run long bars through the rings that attach to the horse’s harness, so as the horse walks around the machine, the wheel turns and mechanical energy is generated. The machine in the advertisement is, literally, a five horsepower engine. It gets difficult to search for similar machines, because “horse-power” pulls up pictures of late-model Fords and Toro lawnmowers. This excellent document has eye-witness description of one of these at work, along with some good pictures and description of what it does. The underside of the machine shows a combination pulley and drive-shaft, which is the output of the power. Another name for these is a horsepower ’sweep’, due to the carousel-like sweeping motion the horses make as they produce their power. At the time, a five-horsepower steam traction engine was an unhappy combination of expensive, difficult to use, and dangerous when things go wrong. The ongoing industrial revolution was producing innumerable labor-saving devices for the farmer, and this was the way to get the power without replacing your horses or investing in a big expensive machine that’d probably kill you, or at least take a bunch of your fingers. Not that the open gearing of the horse-power above was all that much more safe, but it’s easier to stop well-trained horses than to disengage a steam engine. Technology moves quickly, though: the size and reliability of steam and gasoline engines caught up with and exceeded horse-power sweeps by the beginning of the 20th century, so the window for these links between the unmechanized history of farming and today’s technological marvels of machinery wasn’t very long. You are currently browsing the The Infomercantile blog archives for April, 2013.